What a way to end 2017--with a worldwide media event on the forecourt at TCL Chinese Theatre in December. 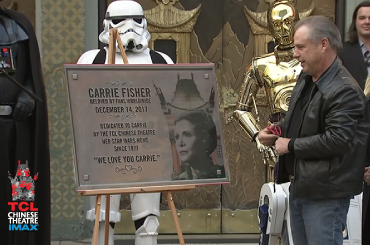 More than 25 camera crews and dozens of reporters and photographers captured Todd Fisher honoring his sister's role with a beautiful plaque commemorating her part in the Star Wars legacy. Digney & Co. is proud to have coordinated this special event as part of the "Star Wars: The Last Jedi" opening at the same theatre were it all started in 1977 with the premiere of George Lucas's first episode of this legendary film series. Before we get too far into 2018, I want to thank our colleagues and media partners for their support in 2017, to make it a banner year. As Spring arrives, Digney & Co. is already busy setting the stage for several major events in the coming months. And we are anxious to share them with you! Watch your email and keep Digney & Co. at the top of your list for events that your audience will love.